If you haven't heard, Lance Armstrong was recently accused of doping. But as I mentioned in the article “Ben Greenfield Admits To Using Performance Enhancing Drugs”, there are safe and natural strategies that go above and beyond banned practices such as doping when you want to improve performance. For example, the topic of cold thermogenesis and cold thermogenesis how to has come up a few times on this show. Podcast episode #187 answered the question Does Cold Thermogenesis Work For Fat Loss? And in Episode #130 Tim Ferriss and Ray Cronise explain how to manipulate your body's temperature to burn more fat. But what about human performance? Do the benefits of cold thermogenesis go above and beyond simply burning fat faster? And if so, how is it that cold thermogenesis could actually enhance performance for a guy like Lance Armstrong or Michael Phelps? I answer all these questions and more in this audio episode with Dr. Jack Kruse, a neurosurgeon who has extensively studied cold thermogenesis and developed cutting-edge protocols for using cold exposure to burn fat and enhance performance. We discuss some cool techniques (pun intended) and cold thermogenesis how to's in the show, and Dr. Kruse even discusses how athletes such as Lance Armstrong and Michael Phelps have benefited from cold thermogenesis. Questions, comments or feedback about cold thermogenesis? Leave them below, and be sure to tune in next week, when I release an interview with founder of “Vasper” a technology that combines exercise, cold exposure, compression and grounding to enhance performance gains. hey, bg…it’s the end of october, my wetsuit comes off after 5 minutes (not the booties or the gloves), as i am floating every day for an hour in my 55-57 degree pool, and i start to shiver about 30 minutes into my sessions. i keep shivering for the 30 minutes i’m in one of those “portable saunas,” which also has a steamer inside, so it’s hot from both sources. i get upstairs, onto my bed, and i’m still shivering. how many calories do you think i am burning? is being warmed up afterward by the steamer/sauna a bad idea, if i had been in 55-degree water for an hour? I hope I haven’t overlooked an answer you gave to another listener already regarding my question but what’s the suggested frequency for ice baths/cold thermogenesis for beneficial results? I do a couple cold showers every day and a long soak or cold swim once per week. That's my method! I am consistently doing low-HR running. And Cold Soaks in the morning and night. Should I be concerned about too-high level of cortisol? So do the cold soaks raise cortisol? I’ve found info saying they raise it and other sources saying they lower it. If cold soaks raise (or lower) cortisol, should we think about the time of day we soak? If cold soaks raise cortisol, should we soak in the morning and add to our naturally higher AM levels of cortisol, or wait and soak later in the day to “spike” our cortisol when it’s naturally on the way down? And the inverse question if cold soaks actually lower cortisol – do we want to dampen the AM cortisol levels by soaking, or wait until later in the day to ride the downward wave? You can get a slight increase in cortisol, yes. But it is more of a hormetic effect and not a big issue for cortisol to go up…and the host of other physiological benefits outweigh any cons unless you have full blown adrenal fatigue. I am experiencing issues with my Thyroid and am taking naturethroid. However I would like to start doing cold thermogenesis in addition to taking the meds because my thyroid fluctuates and while the meds help I have varying results. What are your thoughts on cryotherapy? Is this considered an acceptable form of cold therapy? 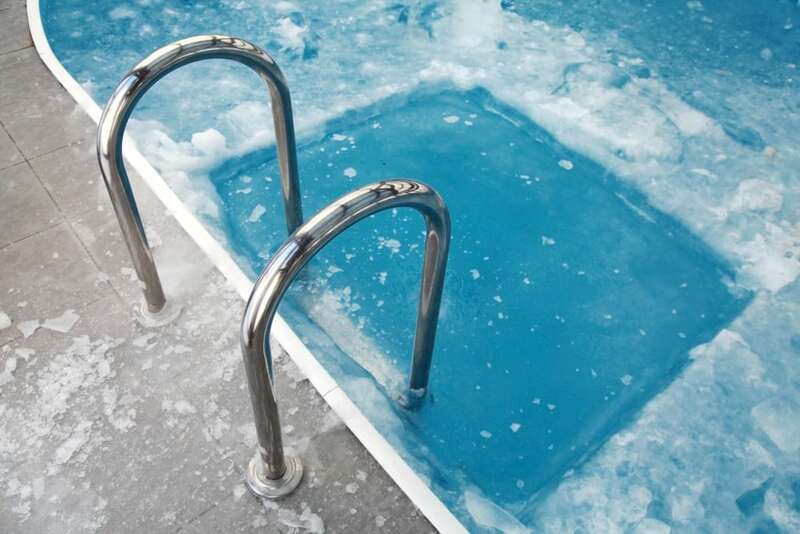 Cold water is way better than cryotherapy because A) your head gets wet, which stimulates the vagus nerve and B) you get the hydrostatic pressure of water against the skin. Just curious….would a pool work for the cold water soak. It is just not feasible for me to get a good soak in our oversized tub. I can take a cold shower but I was wondering if just using the pool would work as well, especially now that fall and winter are approaching. Hello Ben. Great podcast. Can you tell me more please about keto adaptation for kids, let sey 10 years old. It is about my older sun, he plays tennis and he is a skier but he has a little bit of belly fat, but he is very strong, with very hard muscles. His brother, 8 years old, plays also tennis and he is skiing also and has almost no body fat. We eat healthy, I am around 9% body fat (athlete) and my wife around 13-14%. We eat the same food. Why is so big differences in body fat in the kids. Is it a good idea to be a little bit more extreme considering the food, let say less carbs, more fat for the kids…is it ok? What do you recomend? Thanks. for more specific details, I'd be happy to help you via a personal one-on-one consult. Just go to https://bengreenfieldfitness.com/coaching. and then choose a 20 or 60 minute consult, whichever you'd prefer. I can schedule ASAP after you get that. Brrrr. I’ve been using cold showers for a while and still, ooph. Now, just for clarification: you’re supposed to walk away feeling better right? I usually feel drained following a cold shower. Great episode! Jack seemed to dial it down for the lay audience. I especially enjoyed the image of Jack Kruse lying in his tiled cellar floor, naked, drinking wine. Did you just reference the Simpsons Ben? If doing ice baths (mainly for recovery purposes after workouts) is it okay to wear booties? I have thermal surfing boots and used them today. My feet typically go numb when I do ice baths and that has been refraining me from doing them at all. Thanks so much! It's not only okay, it's recommended! Getting frost bite on your fingers, toes and (ahem) other bits is not the intended outcome. I would firstly like to thank you for providing an informative, thoughtful and well researched articles and podcast.I have a question regarding cold thermogenesis. I was hoping that you could discuss or contrast the effects/ benefits of pure cold exposure (all cold water) versus hot / cold alternating contrast. I am inquiring specifically as it pertains to a shower protocol. Is one better off to use only cold water, or to cycle between hot and cold? Or is this dependent on ones goals? (recovery to use cycling of hot and cold, and for metabolic effects to use purely cold)? did your opinion change here, or would you still recommend cycling between hot and cold contrary to showering purely cold? This was an amazing and very useful podcast with a lot concrete information you can implement in your life. Any chance of a transcript without the chirping? LOL. I'm interviewing him again tomorrow night and hopefully there's no bird. Do you have a link to this new interview? Couldn’t focus with the chirping. thank you for all the amazing info! Would you recommend doing cold thermogenesis even for someone being hypothyroid or should that person wait until he has optimized its thyroid function? it like listen to loveline with smoke detector beeping every 30 second. MAN one question who owns that bird………. My professor once said that these three had their best diet before they landed to the moon. A good get ripped diet benefit a successful landing to the moon. Right? The more likely mechanism for something like this would be increased cortisol from stress related to the heat, Winnie. I have never seen any evidence that heat exposure can directly increase fat stores. You can mitigate heat damage by doing, as you have alluded to, cold thermogenesis post hot exercise sessions! Is anyone else aware of the constant screaming in the background? Gosh,i love this cast, but i cant listen , its too painful. it sounds like chirping birds really loudly. Hi, Does anyone know of a way of chanigng the way that emails look in your inbox so that you can see at a glance if they have been replied to without opening them to see if there is the text you replied on xxxx’ ? I’m looking for a simple way of telling when an email hasnt been replied to without having to do anything so the ideal way would be for all emails that have been given a reply to change colour in the inbox so its clear which emails have and havent been replied to. Any ideas anyone? Maybe an add on? We are an internet retailer and get hundreds of emails per day at times so i want an idiot proof way of missing an email to reply to. We use outlook 2007 at the moment. I'm gonna start taking cold showers and not using the wetsuit for my surfing sessions this winter…..Are there any studies or data out about being able to raise our ATP production to an incredibly high number like the 460 Dr. Kruse mentioned? Cole, that type of ATP production is a fixed value. What you CHANGE is how much fat you burn as a fuel and how many calories you burn to create heat! Hey Ben, not sure it was this podcast you talked about Sherpas and their ability to perform at high altitudes. I had a genetics class years ago and I remember a lecture on the population in Nepal having a distinct variation in their hemoglobin giving it a higher affinity for oxygen. Just a thought. We have Gurkhas. In general, they loose this ability about after the third generation away from the region they are born. The government of a certain dictatorial country replaces the existing batch of gurkhas with new blood every two generations or so. Hypoxic training is different to cold adaptation. What's up with that bird? Yeah, I have no clue. It is a loud one though. This doc lost me in the first few minutes of the interview when he said something like humans originated from rodents in Mexico. He also mentions packing yourself in 30-40 pounds of ice in the bathtub. The real and dangerous risk of frostbite in such a case was never brought up. Your idea of wading a cool stream is so much more realistic (and actually enjoyable). I'm a big fan, BG, but his one was a bit out there even for you, man. Well, regardless, if you keep listening, he does go over some good information, although I don't share his theories on the origin of man. So now I won't complain when they turn down the pool temperature for the swim team this winter. I have a question for you Ben, a couple weeks ago we had a solid week of rain and cool temps. When I went for my weekly open water swim it was really cold and I was shivering uncontrollably for a good 10 minutes after my swim (even with the wet suit). The two guys I was swimming with also thought it was cold, but did not shiver after. Any thoughts on why I got so much colder then them? I don't think they were swimming super hard or anything. I know there are probably a lot of variables and reasons that you can't take into account without knowing more details, but any general thoughts would be appreciated. I can be multifactorial – including cardiovascular efficiency and blood flow, omega 3 to omega 6 fatty acid ratio, total body fat %, previous experience with cold conditions, etc. So there's not really a simple answer without digging deeper! I lower my heart rate and number of breaths but increase length of gradual breathing as part of not shivering in order not to fight the cold but accept cold and lower core temperature. This is done gradually over months and years from one temperature gradient range to the next. If you fight the cold consciously your body will shiver, as if you did not have sufficient food to burn for energy. Also, I have a high metabolic rate, and sweat when I exercise at 0 degrees Celsius and below, warm and sometimes burning when at resting. Not so good in hot humid tropics. My 14 year old daughter is a serious cross-country runner. She had her first summer "weight room" training yesterday. Their strength coach uses exercises that use the students' own bodies for resistance, but it is pretty intense. After a similar first time experience, my older daughter could hardly move the next day. Caroline has been taking 1 cold shower and 1 cold bath a day for about a week. She also eats a very anti-inflammatory diet. Immediately after her strength training, she took a long cold bath. This morning she reported virtually no soreness. Also, after only a few days of CT, she ran her best 5K ever. We're looking forward to her CC season this year, using CT. Awesome. Best of luck to your daughter, Jennifer. Can’t it become counter-productive to use cold therapy after most training sessions? I imagine that it could blunt the inflammatory processes that are part of normal training adaptation. If the purpose of strength training is to create a cellular stress on the body, wouldn’t an attempt to immediately reduce that stress counteract the entire purpose of the training? Would adapting to being able to handle more and more CT affect heat acclimation for a hot race in the summer? From a physiological standpoint, absolutely, because you're massively boosting both cardiovascular efficiency and pain tolerance at the same time. It buys you time but not for the long term, such as living in hot humid tropics for more than a number of years. Still fairly new to your podcasts, but am finding them really great. Not sure if i listened to it hear or read it , but did you mention the effects of a cold shower in the mornings, instead of a normal shower, having a fat burning effect. Facinating topic. It might partly explain why after becoming hypothermic during the IMMelb swim (shivering, black hands, numb peripheries etc), twisting ankle on exit, continuing to have extremely uncomfortable bike (shivering most of the time) and actually sub par performance in both bike (5:41) and swim (1:27) for what I was expecting. However I then ran a massive pb, sub 4 marathon which was completely unforeseen from training or previous results, and with a twisted ankle! I actually took in nowhere near the recommended carb on the bike (couple of bananas and some SIS go gel) and even less on the run(about 1.5 TORQ gels plus sips/spits coke), yet felt terrific energy levels on the run which was most uncharacteristic. It was a cool day (26degrees). I live in NW Tasmania, where our temp is cool and our water very cold, even in summer in a wetsuit, I have a well developed facial cold tolerance! However, my question is despite living in a now cool temperature for over 7 years now, and having magnesium supplement and a fairly low carb diet – I still very much struggle with immersion and core cooling in that my hands and feet turn black, and my record capillary refill is 9-10 seconds. I have seen dead people with better! I find this rather disconcerting and it is a disincentive for persisting with the more extreme CT (husband routinely has ice baths with no problems). I think the ice bath is a phenomenal tool, and would love to use it, but at the moment I seem very much limited to cold water wading with a well covered upper body and hands! Is there any evidence that extreme CT can be dangerous for people like me with Raynauds phenomenon or disease or peripheral circulatory issues? Not necessary to use cold water for CT. Water is a better conductor of cold or heat, depending on your perspective, than air. I used cold air, conduction, with activities, ingestion of cold water, less of cold shower. Takes longer to get benifits of CT as it is more gradual. Did not need ice at all. My route was accidental CT as the family I lived with saved on heating with an unexpected side effect, that I exercised anaerobic, ate more, and subsequently converted to a higher fat diet, and importantly, did not fight breathing in cold air, but in controlled long breathes mixed with intermittent short inhales. Start with warming shower, end with ice cold shower. No ice packs or fancy gizmos volved. I don't recall Sherpas nor Gurkhas using fancy stuff.